Around the Corner, Outdoor Recreation, Focus on Energy, Lighthouse Tours & more! 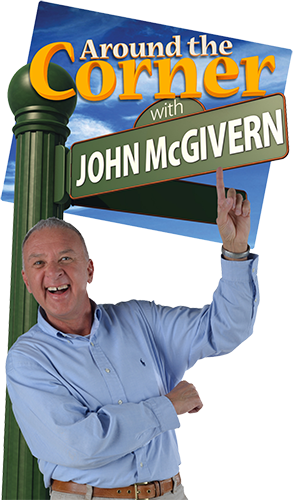 "Around the Corner with John McGivern" Preview Event on March 19! Last summer, a crew from the PBS show "Around the Corner with John McGivern" visited Wind Point to record an episode featuring Wind Point and Caledonia. That episode is set to air for the first time on Milwaukee PBS on Thursday, March 29 at 7 p.m. You can be among the first to see it by attending the public preview event on Monday, March 19 at The Prairie School. Doors open at 4:30 p.m. and the show starts at 5:30 p.m. The event is free and open to the public, but reservations may be necessary. Just go online to www.prairieschool.com/aroundthecorner or, if you prefer to make reservations by phone, call Debra at 414-297-7514. Attendees will also get a free DVD of the episode! Thank you to all who participated in the Outdoor Recreation workshop and visioning meeting on February 15 at Wingspread! About 50 residents were in attendance to give feedback on a Comprehensive Outdoor Recreation Plan (CORP) for the Village. 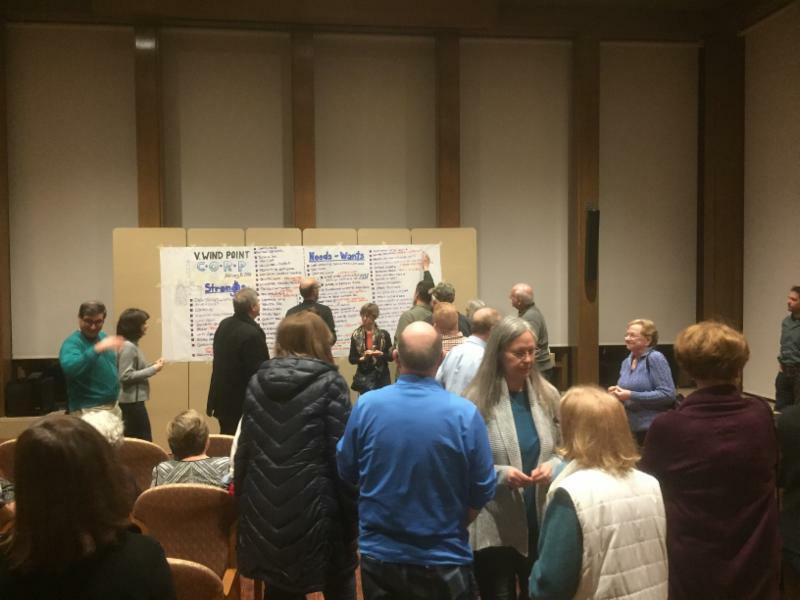 Project facilitator Jeffrey Sanders conducted a visioning session intended to identify community strengths and recreation needs. The visioning portion of the meeting was followed by a prioritization phase during which attendees placed adhesive dots onto the wall graphic adjoining the "Needs or Wants" for which they each placed the highest value. Input from the meeting, along with data collected from the recent outdoor recreation survey, will be incorporated into the resulting CORP. Mr. Sanders will provide a first draft of the plan by early spring, which will be posted online and shared in an upcoming E-News. Look for updates in future newsletters and on the project webpage . Thanks again to all who attended the workshop, as well as those who responded to the survey. Special thanks to The Johnson Foundation for hosting the workshop! A spring primary election was held on Tuesday, February 20. 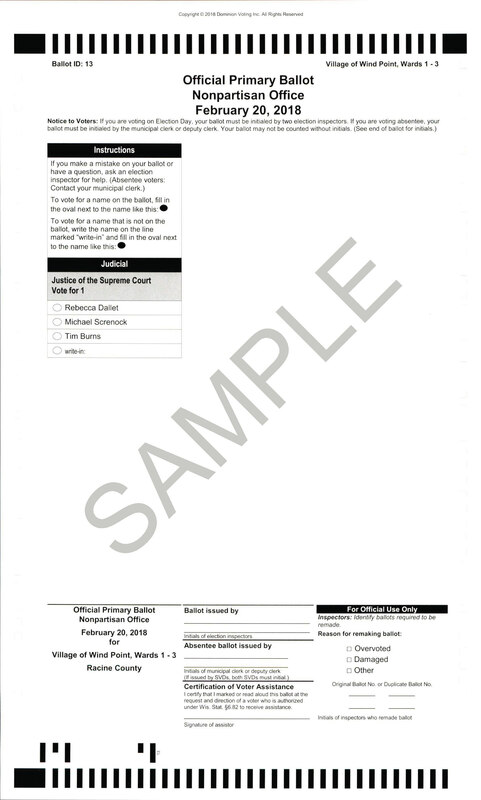 The only race on the ballot in Wind Point was a statewide primary for Wisconsin Supreme Court Justice. A total of 345 ballots were cast in the Village, which accounts for a 27.4% turnout of registered voters. Michael Screnock received 183 votes, Rebecca Ballet received 129 votes and John Tim Burns received 33 votes. The total turnout of voters in Racine County for this election was 18,362, or 18.3% of registered voters. 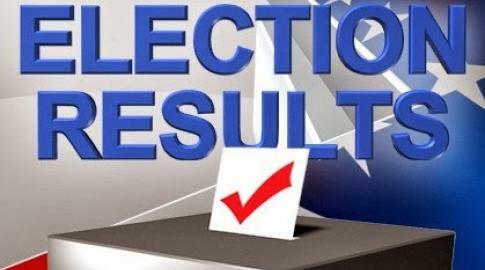 To view the county-wide results, click here . The spring election will be held on Tuesday, April 3. 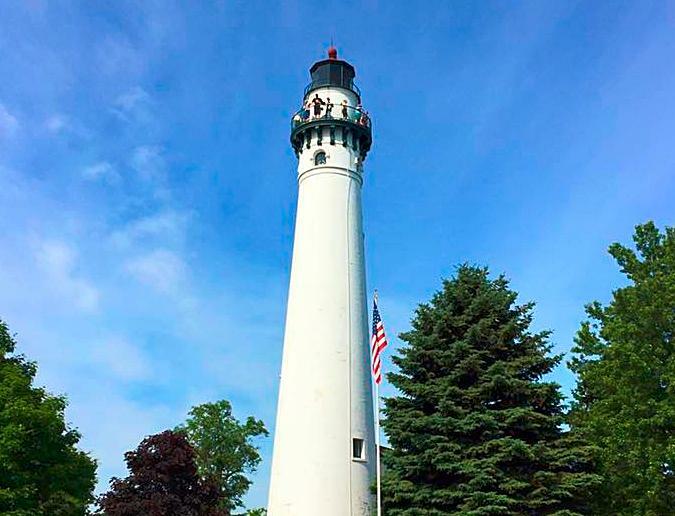 The three Metal Halide light fixtures that had lit our lighthouse at night were recently replaced with three new LED fixtures. The change reduced the energy consumption from 455W to 130W per unit, a more than 70% reduction – the combined wattage of all three of the new fixtures is now less than just one of the old lights. The new fixtures are designed to be maintenance free for more than a decade and unlike the lamps used in the old product, they don’t contain mercury making them environmentally friendly well beyond the significant energy savings. The new LED lights were built in Racine by Cree Lighting. Cree donated the fixtures and lighthouse keeper Joseph Huser installed them so the lighting upgrade was achieved at no cost to the Village. Focus on Energy Program Offers Free Energy Saving Products! Wisconsin's Focus on Energy program is offering free energy saving products to homeowners! All customers of WE Energies in Wind Point, including homeowners and renters, are eligible to participate. Just visit focusonenergy.com/simple , and select from one of six different packs (valued around $40). 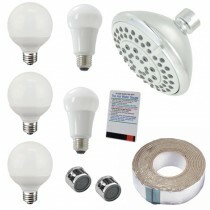 The energy saving packs include items such as light-emitting diode light bulbs, high-efficiency showerheads, water-saving bathroom faucet aerators and showerheads, pipe insulation, and advanced power strips for home entertainment centers and office areas. Not only are these packs free, but they can help save money on your energy bills! All packs ordered are shipped straight to your doorstep for free. Have your electric and gas utility account number available when ordering; one pack per household. Sunday, June 3, 2018 – 9 a.m. to 3:30 p.m.
Saturday, June 30, 2018 – 10 a.m. to 2 p.m.
Sunday, July 1, 2018 – 9 a.m. to 3:30 p.m.
Saturday, August 4, 2018 – 10 a.m. to 2 p.m.
Sunday, August 5, 2018 – 9 a.m. to 3:30 p.m.
Saturday, September 1, 2018 – 10 a.m. to 2 p.m.
Sunday, September 2, 2018 – 9 a.m. to 3:30 p.m.
Sunday, October 7, 2018 – 9 a.m. to 3:30 p.m.
Reservations for public tour times can be made online at windpointlighthouse.org (click on “Book a Tour” or “Visit Us”). 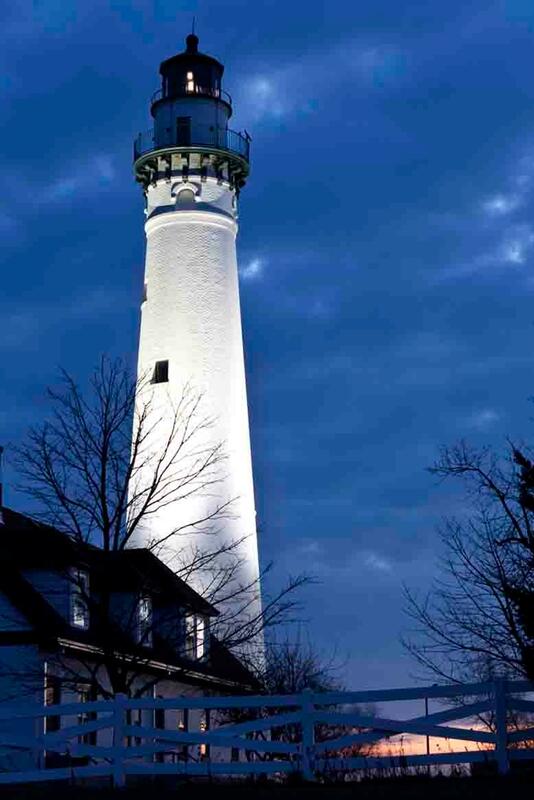 Tours for private groups are also available by making arrangements with the lighthouse keepers - more information about private group tours is available at http://windpointlighthouse.org/visit-us/ . If you are interested in getting involved at the lighthouse as a volunteer, please contact Mary Ann and Joseph. Extra help is needed to coordinate tours – if going up the tower isn’t your thing, we also have a need for people at the ground level to greet and register guests. Light lunch and refreshments are provided on tour dates. Contact Mary Ann at 262-639-3777 or lhkeeper@windpoint.org . Property owners will notice a one-time adjustment on their first quarter bills that will be mailed out on March 15, 2018. The adjustment is needed to correct a billing error in which the updated water consumption rate was not used for a portion of 2017. The average adjustment on a residential water bill will be $6.01. For properties that were sold during the year, the current owner will only receive an adjustment for consumption that occurred while they owned the property. While it is not a large adjustment, the Public Service Commission (PSC) requires utilities to make adjustments for any under- or over-billings. If you have any questions, please contact the Village Office at 262-639-3524 or info@windpoint.org . Wind Point is home to many nice cul-de-sacs with large islands with trees and green space. As a matter of public safety, please remember that vehicles should only enter cul-de-sacs on the right side and should only drive in a counter-clockwise direction around them. Thank you for your cooperation! The full 2018 budget document is now available to view on the Village website. 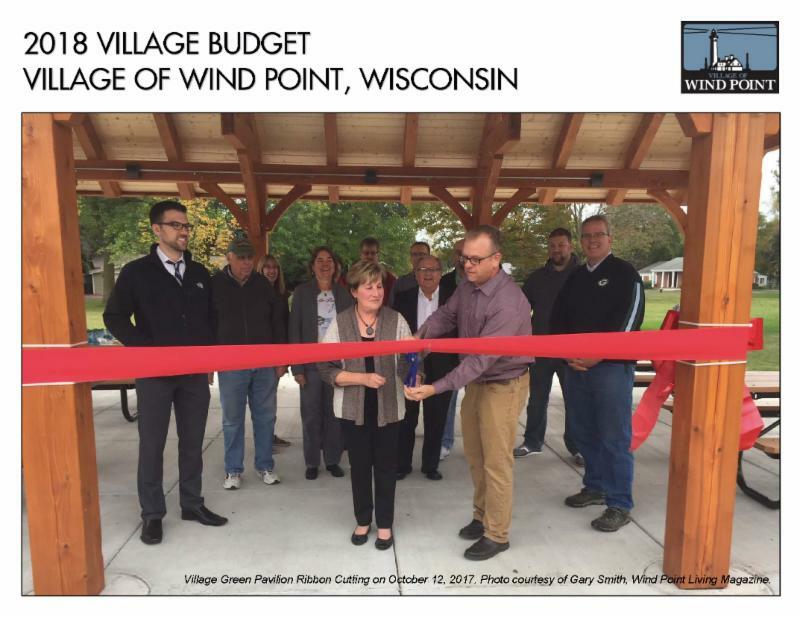 The budget was adopted by the Village Board on November 9, 2017. Staff has since updated the various narrative sections of the document as well as the tables and charts measuring service outputs. The budget is more than a financial plan, but a communication tool about the functions and goals of the Village entity. To view the 2018 budget document, click here . Heard an update on a title review regarding outlots along Deepwood Dr.
Heard a report from the Village Engineer about 2018 road projects. Approved a final amendment to the 2017 Budget (Resolution 18-R02). Heard a quarterly update on the Village’s investments. Reviewed the results of the outdoor recreation survey. Approved additional public tour dates at the lighthouse for 2018 season. Referred the Public Safety & Emergency Preparedness Committee to review an idea for providing reflective vests to the public. The next regular meeting is scheduled for Thursday, March 8 at 5:30 p.m. at the Village Hall (lighthouse).